Voter suppression is a strategy used to influence the outcome of an election by discouraging or preventing specific groups of people from voting. It is distinguished from political campaigning in that campaigning attempts to change likely voting behavior by changing the opinions of potential voters through persuasion and organization. Voter suppression, instead, attempts to reduce the number of voters who might vote against a candidate or proposition. The tactics of voter suppression range from minor changes to make voting less convenient, to physically intimidating and even physically attacking prospective voters, which is illegal. Voter suppression can be effective if a significant number of voters are intimidated or disenfranchised. In 2013, the United States Supreme Court ruled in Shelby v. Holder that voting laws had resulted in voter suppression and discrimination. In Australia, it is mandatory for citizens to enroll to vote and it is their responsibility to update their enrollment when they change their address. Even so, it is estimated that about 6% of eligible Australian voters are not enrolled, or are enrolled incorrectly. These are disproportionately younger voters, many of whom might neglect to enroll when they attain voting age. In 2006, the Howard Government legislated to close the electoral roll much earlier once an election was called. While previously, voters had been allowed seven days of grace after an election had been called to arrange or update their enrollment, new voters were now allowed only until 8:00 pm on the day that the electoral writ was issued to lodge their enrollment form, while those who needed to update their addresses were allowed three days. In Australia, the Prime Minister effectively has the right to determine the date of the election, so long as constitutional rules regarding the maximum term of the parliament are adhered to. This measure was therefore likely to result in many newer voters being precluded from voting in the first election for which they were eligible because the time to arrange their enrollment once an election is called had been greatly reduced. The measure was widely seen as an attempt at voter suppression aimed at younger voters, who surveys had shown are more likely than the general population to vote for the then opposition, the Australian Labor Party, or the Greens. The Government denied that they were trying to suppress some voters, insisting that the purpose of the reform was to smooth the administration of elections and to reduce the possibility of electoral fraud. This was in spite of the fact that the Australian Electoral Commission had requested no such reform, there was no evidence of significant electoral fraud and that the Australian Electoral Commission had been dealing with hundreds of thousands of late enrollments without significant problems for decades. In July 2010, the left-leaning lobby group GetUp! launched a challenge to this law. The High Court of Australia expedited the hearing so that a ruling could be made in time for the 2010 federal election. The majority ruling struck down early closing of the roll, reinstating the old rule allowing voters seven days grace to arrange or update their enrollment. Australian citizens of the ages 16 or 17 can enroll online so that when they turn 18 they are able to vote. Shortly before the Canadian 2011 Federal Election, vote suppression tactics were exercised by issuing robocalls and live calls to notify voters that their polling station had changed. The locations offered by these messages were intentionally false, often to lead voters several hours from the correct stations, and often identified themselves illegally as coming from Elections Canada. In litigation brought by The Council of Canadians, a federal court found that such fraud had occurred and had probably been perpetrated by someone with access to the Conservative Party's voter database, including its information about voter preferences. The court stated that the evidence did not prove that the Conservative Party or its successful candidates were directly involved. It did, however, criticize the Conservative Party for making “little effort to assist with the investigation”. The court did not annul the result in any of six ridings where the fraud had occurred, because it concluded that the number of votes affected had been too small to affect the outcome. In April 2019, during Israel's general elections for the 21st Knesset, Likud activists installed hidden cameras in polling stations in Arab communities. Election observers were seen wearing such cameras. Hanan Melcer, the Head of the General Elections Committee, said the cameras were illegal. The following day, PR agency Kaizler Inbar took credit for the operation and said it had been planned in collaboration with Likud. They additionally claimed that voter turnout in Arab communities had fallen under 50% thanks to the presence of the agency's observers in the polling stations, though there is little evidence that the cameras had any effect on the voter turnout, as the Arab population had been promising to boycott the election well in advance . Lutfur Rahman was the directly elected mayor of Tower Hamlets, in London until he was removed from office for breaching electoral rules. His supporters allegedly intimidated voters at polling stations. Current proposals by the Conservative Party to require one of several forms of expensive photo-ID in order to vote are likely to reduce the turnout of young and poor voters more likely to vote Labour. In the United States, elections are administered locally, and forms of voter suppression vary among jurisdictions. At the founding of the country, the right to vote in most states was limited to property-owning white males. Over time, the right to vote was formally granted to racial minorities, women, and youth. 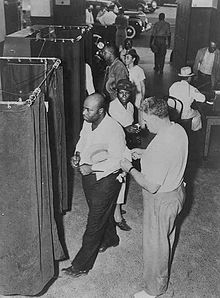 During the later 19th and early 20th centuries, Southern states passed Jim Crow laws to suppress poor and racial minority voters – such laws included poll taxes, literacy tests, and grandfather clauses. Most of these voter suppression tactics were made illegal after the enactment of the Voting Rights Act of 1965. In 2013, discriminatory voter ID laws arose following the Supreme Court's decision to strike down Section 4 of the Voting Rights Act, which some argue amount to voter suppression among African-Americans. In Texas, a voter ID law requiring a driver's license, passport, military identification, or gun permit, was repeatedly found to be intentionally discriminatory. The state's election laws could be put back under the control of the U.S. Department of Justice (DOJ). Under Attorney General Jeff Sessions, however, the DOJ has expressed support for Texas's ID law. Sessions was accused by Coretta Scott King in 1986 of trying to suppress the black vote. A similar ID law in North Dakota, which would have disenfranchised large numbers of Native Americans, was also overturned. In Wisconsin, a federal judge found that the state's restrictive voter ID law led to "real incidents of disenfranchisement, which undermine rather than enhance confidence in elections, particularly in minority communities"; and, given that there was no evidence of widespread voter impersonation in Wisconsin, found that the law was "a cure worse than the disease." In addition to imposing strict voter ID requirements, the law cut back on early voting, required people to live in a ward for at least 28 days before voting, and prohibited emailing absentee ballots to voters. Other controversial measures include shutting down Department of Motor Vehicles (DMV) offices in minority neighborhoods, making it more difficult for residents to obtain voter IDs; shutting down polling places in minority neighborhoods; systematically depriving precincts in minority neighborhoods of the resources they need to operate efficiently, such as poll workers and voting machines; and purging voters from the rolls shortly before an election. Often, voter fraud is cited as a justification for such laws even when the incidence of voter fraud is low. In Iowa, lawmakers passed a strict voter ID law with the potential to disenfranchise 260,000 voters. Out of 1.6 million votes cast in Iowa in 2016, there were only 10 allegations of voter fraud; none were cases of impersonation that a voter ID law could have prevented. Iowa Secretary of State Paul Pate, the architect of the bill, admitted, "We've not experienced widespread voter fraud in Iowa." In May 2017, President Donald Trump established the Presidential Advisory Commission on Election Integrity, purportedly for the purpose of preventing voter fraud. Critics have suggested its true purpose is voter suppression. The commission is led by Kansas secretary of state Kris Kobach, a staunch advocate of strict voter ID laws and a proponent of the Crosscheck system. Crosscheck is a national database designed to check for voters who are registered in more than one state by comparing names and dates of birth. Researchers at Stanford University, the University of Pennsylvania, Harvard University, and Microsoft found that for every legitimate instance of double registration it finds, Crosscheck's algorithm returns approximately 200 false positives. Kobach has been repeatedly sued by the American Civil Liberties Union (ACLU) for trying to restrict voting rights in Kansas. ^ Powers, Scott; David Damron (January 29, 2013). "Analysis: 201,000 in Florida didn't vote because of long lines". Orlando Sentinel. Orlando, FL. Retrieved 2016-02-26. ^ Van Dongen, Rachel; Everett, Burgess (25 June 2013). "Harry Reid: Senate 'will act' on Voting Rights Act". Politico. Retrieved 5 July 2013. ^ Orr, Graeme "Court by surprise: the High Court upholds voting rights", 6 August 2010. ^ "Robocalls complaints came 3 days before 2011 election". CBC News. 2012-11-19. Retrieved 2012-11-19. ^ a b c d MacCharles, Tonda (May 23, 2013). "Robocalls: Widespread but 'thinly scattered' vote suppression didn't affect election, judge rules". Toronto Star. Retrieved 2013-05-27. ^ "Outrage as Likud activists secretly film voting in Arab communities". Ynetnews. 2019-09-04. Retrieved 2019-04-10. ^ "i24NEWS". www.i24news.tv. Retrieved 2019-04-10. ^ "קייזלר ענבר". www.facebook.com. Retrieved 2019-04-10. ^ "Tower Hamlets election fraud mayor Lutfur Rahman removed from office". BBC News. 23 April 2015. Retrieved 23 April 2015. ^ "Electoral Reform Society letter calls the move 'disproportionate'". The Guardian. 6 March 2018. Retrieved 6 March 2018. ^ Bret Carroll. American Masculinities: A Historical Encyclopedia. SAGE Publications; 14 October 2003. ISBN 978-1-4522-6571-1. p. 89. ^ Christina Rivers. The Congressional Black Caucus, Minority Voting Rights, and the U.S. Supreme Court. University of Michigan Press; 17 July 2012. ISBN 0-472-11810-2. pp. 146–48. ^ Jennifer Macbain-Stephens. Women's Suffrage: Giving the Right to Vote to All Americans. Rosen Classroom; January 2006. ISBN 978-1-4042-0869-8. ^ United States. Congress. Senate. Committee on the Judiciary. Subcommittee on Constitutional Amendments. Lowering the voting age to 18: Hearings, Ninety-first Congress, second session. U.S. Govt. Print. Off. 1970. ^ Kimberley Johnson. Reforming Jim Crow: Southern Politics and State in the Age Before Brown. Oxford University Press; 16 April 2010. ISBN 978-0-19-988904-4. p. 97. ^ Michael J. Klarman. From Jim Crow to Civil Rights: The Supreme Court and the Struggle for Racial Equality. Oxford University Press; 5 February 2004. ISBN 978-0-19-535167-5. p. 70. ^ Walter Hazen. The Civil War to the Jim Crow Laws: American Black History. Milliken Publishing Company; 1 September 2004. ISBN 978-0-7877-2730-7. p. 38. ^ Childress, Sarah (June 26, 2013). "With Voting Rights Act Out, States Push Voter ID Laws". FRONTLINE. PBS. ^ Childress, Sarah (June 25, 2013). "Supreme Court Strikes Blow to Voting Rights Act: What's Next?". FRONTLINE. PBS. ^ "Read the letter Coretta Scott King wrote opposing Sessions's 1986 federal nomination". The Washington Post. January 10, 2017. ^ a b "As November Approaches, Courts Deal Series Of Blows To Voter ID Laws". NPR. August 2, 2016. ^ "Case: 3:15-cv-00324-jdp Document #: 234 In the United States District Court for the Western District of Wisconsin" (PDF). Retrieved January 23, 2018. ^ "DOT launches investigation in Alabama over DMV closures". CNN. December 9, 2015. ^ "The State of Alabama Has Fully Lost Its Mind". Esquire. April 12, 2017. ^ "There Are 868 Fewer Places to Vote in 2016 Because the Supreme Court Gutted the Voting Rights Act". The Nation. November 4, 2016. 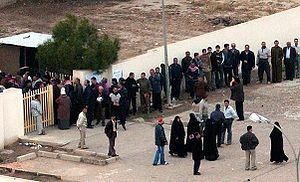 ^ "Long Lines at Minority Polling Places". The New York Times. September 24, 2014. ^ "Ruling Preserves Voting Rights for Thousands in North Carolina". The New York Times. November 4, 2016. ^ "Iowa's New Voter-ID Law Would Have Disenfranchised My Grandmother". The Nation. April 13, 2017. ^ "How Trump's nationwide voter data request could lead to voter suppression". The Washington Post. June 30, 2017. ^ "The Man Behind Trump's Voter-Fraud Obsession". The New York Times. June 13, 2017. ^ Speri, Alice (October 27, 2016). "Voter Suppression is the Real Election Scandal". The Intercept. ^ Kass, John (December 15, 2018). "College kid beats back the Chicago machine and Boss Madigan blinks". Chicago Tribune. Retrieved 2018-12-17.